Punnett's Square: New Tests on Roundworms Using the Antibiotic Minocycline Found to have Increased the Lifespan by Inhibiting Protein Aggregation and Could Lead in to Help the Fight Against Multiple Neurodegenerative Diseases in Humans. New Tests on Roundworms Using the Antibiotic Minocycline Found to have Increased the Lifespan by Inhibiting Protein Aggregation and Could Lead in to Help the Fight Against Multiple Neurodegenerative Diseases in Humans. Many progressive age-related brain disorders are due to impaired proteostasis. Proteostasis is the systematic process of the production of proteins and the disposal of them from the body. Impaired proteostasis could mean a couple different things might be faulty. A well functioning process of proteostasis means that there is a good balance between the production of proteins and the disposal of them. Neurodegenerative symptons begin when there is a disruptance in this balance. Either there is an over/underproduction of proteins or there is an increase/decrease in the disposal of the proteins. Gregory M Solis from the The Scripps Research Institute and colleagues from other research institutes ran tests on Caenorhabditis elegans, a species of roundworms, that are relatively old with deficiency in stress signaling pathways. Stress signaling pathways (SSPs) are the cells way of telling itself that their is stress on the cell. This can include intruding toxins, mechanical damage or extreme temperatures that inhibit reactions that occur in the cell. However, cells that become dependent on this have difficulties responding to stressors later in its life when they lose the ability to activate SSPs. Minocycline, an antiobiotic that is known to have neuroprotective and anti-imflammatory properties in mammals, was used on the worms to suppress cytoplasmic protein synthesis and the production of aggreation-prone proteins. By minimizing the production of these proteins it relieves the demand on the multiple pathways that induce protein synthesis, such as SSPs. Therefore reducing the effects aging has on cellular function. Minocycline is used by humans now for medicinal purposes however because of its multitude of side effects which include nausea, vertigo, and mild dizziness just to name a few. The risk for these symptoms has prevented the usage for minocycline for many different neurodegenerative diseases because the harmful effects will have major impacts on the patients who are typically of an older age group, who do not have strong enough metabolic pathways to prevent these symptons. This limits its use in humans right now to its anti-inflammatory effects. As of now Minocycline is a major product used in curing acne vulgaris and sexually transmitted diseases and is soley used for those reasons until methods of reducing the chances of the detrimental symptoms are discovered. Nice post! 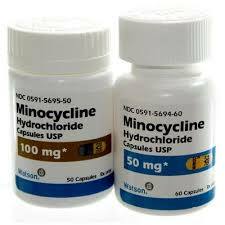 It is interesting that there are so many uses for Minocycline including acne and sexually transmitted diseases. I cannot wait to see what it can do for us in the future.